Image captured by cell phone, cropped for composition. I toned down some annoying blown out areas in the yellow petals by restoring color from other areas, and I significantly sharpened foreground areas while leaving OOF background unsharpened to avoid noise enhancement. 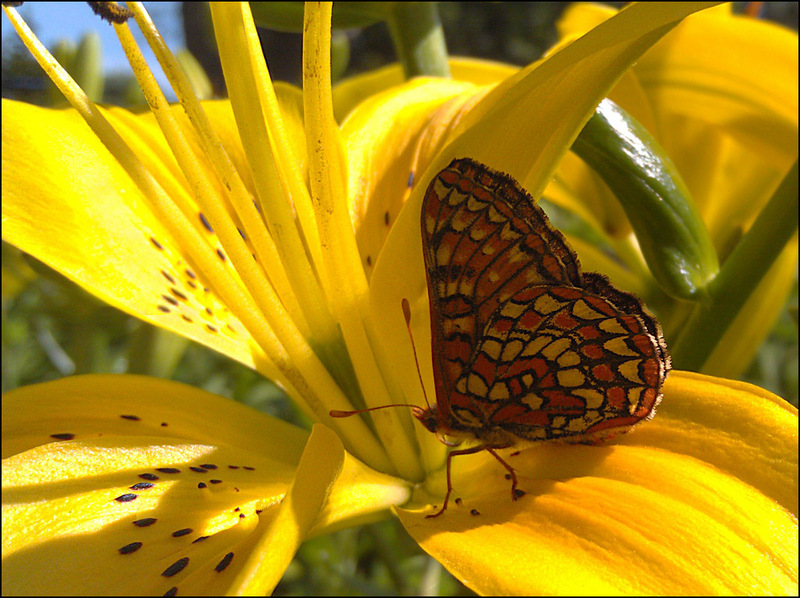 The subject is a "Northern Checkerspot", to use the notation in Butterflies of Cascadia. In that book, the species identification would be Chlosyne palla (Boisduval), most likely C. p. sterope (W.H. Edwards). But the group has been shuffled around based on newer information such that this is probably what Life Histories of Cascadia Butterflies would call the Sagebrush Checkerspot Chlosyne acastus (W.H. Edwards). I don't normally see these in my backyard, but the host plant for acastus does grow within flying distance, and the dorsal surface of this beast had a B/W appearance that seemed consistent with a freshly emerged acastus female.